One of the landmark moments of 2018 was when Christie’s New York became the first auction house to sell a piece of work produced by Artificial Intelligence. Whilst Edmond de Belamy wasn’t much of a looker, the piece raised more than a few eyebrows when it was sold at auction for a cool $432,500. What troubled the art world most about this sale was that it prompted the question of whether we now need artists at all. Putting this extreme case to one side, with the rise in accessibility of 3D printers, 3D scanners, augmented reality, virtual reality and more, there is now a whole new dimension of canvases available to the artist. And whichever way you look at it, new technology in the hands of bold, human, statement-making artists is certainly something to be excited about. Undoubtedly the most talked about event of 2018 was Banksy’s infamous shredder stunt. Amongst other things, Banksy’s repertoire of stunts suggest that the backing of the traditional art industry is no longer quite so vital when it comes to the art of being talked about. Whilst public popularity, Instagram likes and retweets are not usually a reliable source of determining artistic quality and legacy, the opportunity is now there for any artist to make a noise with or without the blessing of the industry, making for a more levelled and interesting playing field. This is not to say that that the art industry will become redundant, the combination of curator, critic, dealer and collector will still have an enormous influence with regards to which artists cement a place in art history, but the continued rise of social media and the endless possibilities of the world wide web gives more artists the opportunity to step into the bullring. Thankfully, this won’t last. 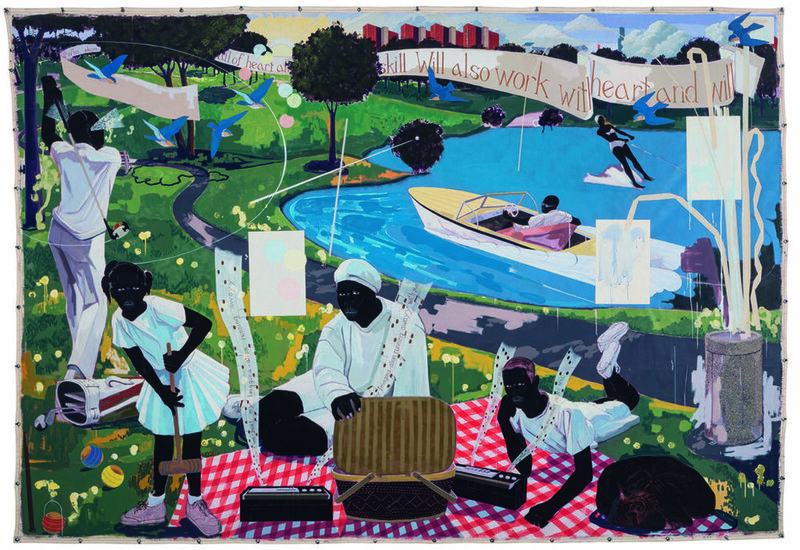 2018 was a strong year for contemporary artists hailing from a variety of different cultures, with a number of pieces by African-American artists doing particularly well last year, including Kerry James Marshall’s painting Past Times, which sold for $21.1 million at Sotheby’s. Additionally, although there is still a relatively large gap in commercial value at the top end of the market between male and female artists, 2018 saw increased bidding and exposure for female artists, with Jenny Saville breaking the auction house record for a living female artist. Generally speaking, “smaller contemporary lots” (the type of thing you or I may find interesting) did very well at auction last year, perhaps suggesting that a new wave of contemporary diversity won’t take quite so long to reach the very top. Watch this space, 2019 is set to be a cracking year of moving and shaking!